In our quick-to-throw-things-away society, plastic and rubber seem to rule. However, many still value stability, craftsmanship and lasting beauty. Items displayed in museums from ancient civilizations – such as bowls, jewelry and art – are often crafted from stones. Their durability is unrivaled and – when made from agate, jasper or other colorful stones – they are mesmerizing. Spheres have always garnered attention, whether the 15-ton ancient stone spheres of Costa Rica or tiny multi-hued marbles. Although one of the simplest shapes, stone spheres are time-consuming to make. What is needed to make a sphere? Start by selecting a suitable rock. Montana is full of gorgeously appropriate rocks: agate, jasper, petrified wood, dinosaur bone, granite, calcite, etc. A piece suitable for sphere making should have nice contrast, interesting patterns or good color combinations. The piece should have no visible cracks or fracture lines. Avoid rocks that may have sections that won’t take a good polish. The softer the rock, the easier it will be to shape. However, it could possibly be easier to break as well. Once the rock is selected, its height, width and depth should be measured. The smallest measurement dictates the maximum size of sphere that can be made. Using a rock saw with diamond blades, cuts should be made to make a cube. Continuing with the rock saw, cut the corners and edges off of the cube. So far 22 cuts will have been made and will leave you with a octadecagon or what looks like a faceted ball. A grinder with silicon carbide wheels should now be used to grind off any remaining high spots. Each step rounds the stone, but it will still be bumpy. The final grinding is best done in a specialized piece of lapidary equipment called a sphere machine. There are two- and three-cup sphere machines. These opposing cups exert pressure from opposite sides and support the bumpy sphere, while still allowing the sphere to randomly rotate. This is a multi-step process that uses grit and water. A different harshness of grit is used in each step, starting with a course grit and finishing with a very fine grit, much as progressively finer sandpaper is used when working with wood. Though the rock is now round, it’s also dull. It must be washed with soap and water and the cups in the sphere machine changed to polishing cups. Cleaning should be done thoroughly and carefully, as even one piece of grit can scratch a sphere and keep it from polishing fully. The final polish will use a slurry made from water and a polishing compound. A delightfully round, beautifully polished and durably made sphere is now ready to be admired and passed down to future generations. 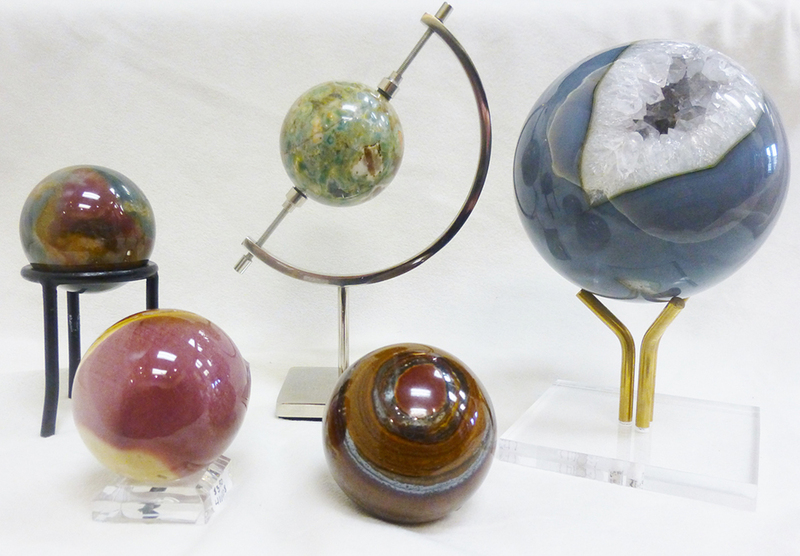 Gazing into the different minerals and refractions in stone spheres is equally calming and exciting. Visit Earth’s Treasures at 25 N. Willson in historic downtown Bozeman and enjoy spheres made from stones found in Montana and around the world. 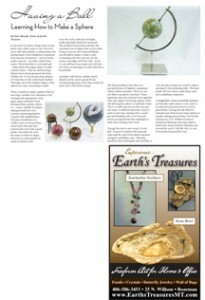 Call 406-586-3451 or visit www.EarthsTreasuresMT.com.